What do you think about Salman Khan’s Blackbuck poaching case conviction? By admin on April 7, 2018 Comments Off on What do you think about Salman Khan’s Blackbuck poaching case conviction? Do you really think doing social work grants him a licence to Kill? Indian judiciary lacks public trust and at many occasions been accused of being highly corrupt. This time, soon after the verdict was handed out in the blackbuck poaching case, the Judge was transferred and even the Judge scheduled to hear actor’s bail plea was transferred hours before the case came in front of the court. 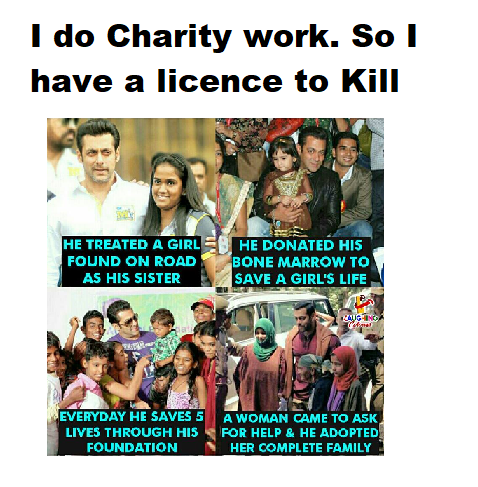 Once before, Salman Khan successfully reversed his conviction saying he is a benevolent man of social work. The actor’s white Toyota Land Cruiser had crashed into American Express Bakery at Hill Road, Bandra killing one person and injuring four on 28th September 2002. Witnesses claimed that they saw the actor leaving the site of the accident and that he was in the driver’s seat. Salman’s blood sample was collected at JJ hospital to determine the alcohol content in his blood. He was tried for culpable homicide not amounting to murder. May 6, 2015 Salman Khan was found guilty of all charges against him. The court pronounced its verdict and sentenced the actor to five years of imprisonment. Salman appealed against the decision and the court acquitted Salman of all criminal charges that he had been held guilty of by a trial court in May. During appeal process Salman Khan’s lawyers came up with stories of his charitable work. In 2002 Mumbai police appointed 24-year-old constable Ravindra Patil as Salman’s bodyguard after Salman Khan filed a police report complaining about threatening calls from the underworld. On 28th September 2002, on the day of the hit and run incident, Salman was drinking at Juhu’s JW Marriott hotel , while Patil waited in the car outside. A drunk Salman drove his SUV over the pavement dwellers, and fled the scene soon after. Patil and few other witnesses explained what they saw to the Police but soon other witnesses changed their statement. Patil stood ground despite pressure from Salman’s lawyers. Patil had reportedly gone into hiding in order to avoid Khan’s lawyers and also alleged harassment from within the police force. Patil was arrested in 2006 for failing to appear as a witness and in November that year he was sacked from the force for being too honest. In 2007, Patil was found on the streets of Mumbai, suffering from TB for over 2 years. He was admitted to Hospital and died there on October 2007. While dismissing the prosecution’s case, Judge AR Joshi also dismissed the statement given by Ravindra Patil, and said he cannot be considered a ‘wholly reliable witness’. Ravindra Patil – An honest man, lost everything standing for the truth. The highly corrupt Police force and Judiciary failed him. Was he injected with Tuberculosis Bacteria by Salman’s men? Such allegations are impossible to prove at this stage.But doubts remain in public mind. Do you think India’s most benevolent and kind actor Salman Khan will pay for his sins?